Life on the early Earth inhabited a planet whose environment was vastly different from the Earth of today. An anaerobic and hot early Earth was the birthplace of the first living cells but wide-spread small-scale physico-chemical diversity provided opportunities for a variety of specialists: alkalophiles, acidophiles, halophiles etc. The earliest record of life has been lost due to plate tectonic recycling and the oldest preserved terranes (~3.9–3.7 Ga) are heavily altered by metamorphism, although they may contain traces of fossil life. As of ~3.5 Ga, ancient sediments are so well-preserved that a broad diversity of micro-environments and fossil traces of life can be studied, providing a surprising window into communities of microbes that had already reached the evolutionary stage of photosynthesis. From the wide variety of traces of ancient life that have been reported from the Archaean geological record in Greenland, Canada, South Africa and Western Australia, we examine a few particularly pertinent examples. Biosignatures in the rock record include microfossils, microbial mats, stromatolites, microbially induced sedimentary structures, biominerals, biologically indicative isotopic ratios and fractionations, elemental distributions, organochemical patterns and other geochemical peculiarities best explained by biological mediation. Due to dynamic geological reprocessing over the billions of years since these fossils entered the rock record, identifications of very ancient traces of life have been subject to criticism, hence the often complex arguments regarding their biogenicity. We here highlight a range of unambiguously bona fide and widely supported examples of fossil biosignatures. 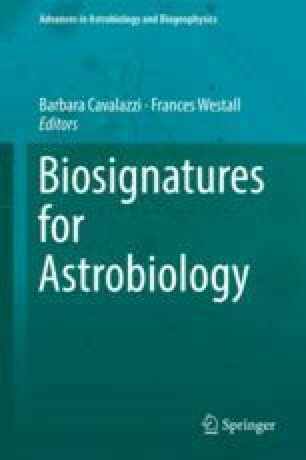 Fossil biosignatures have great promise as analogues of life that might be detected on other planets. In this respect, the study of the early Earth is particularly pertinent to the search for life on Mars, given the planetary- and microbial-scale similarities that prevailed on both planets during their early histories, together with the lack of subsequent geological reprocessing on Mars, which may make it an ideal repository for a near-pristine fossil record. FW and KHL acknowledge support from The French Space Agency (CNES) and the Mars Analogues for Space Exploration (MASE) project supported by the FP7/2007-2013 (grant no. 607297). BC acknowledges support from the FP7-PEOPLE-2013-CIG/INACMa (grant no. 618657).